S&D Prime Maintenance, Inc. is a full-line maintenance and janitorial services company for any size property, delivering a wide variety of services, products and solutions since 1981. Whether your needs are large or small, we can help. S&D is equipped to handle any and all multifaceted projects. Over the decades we have established a reputation for customer service, quality workmanship and rapid responsiveness in meeting and exceeding our customers’ expectations. There is little we cannot do. Whether your needs are large or small, we can help. We are available to do everything from total cleaning, painting, carpet cleaning, carpentry or rebuilding to both the interior and exterior of properties. 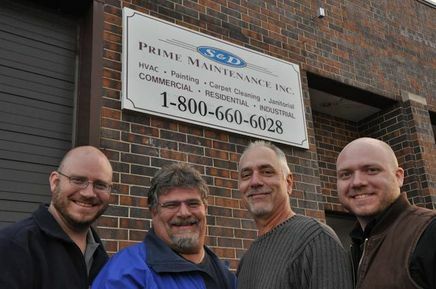 Below you will find some background information on S&D Prime Maintenance, Inc. and an introduction to the fastest growing Maintenance Company, experienced in all phases of industrial, commercial, residential and condominium association needs. S&D Prime Maintenance, Inc., is a full-line maintenance company for small, medium and large properties, delivering various services since 1981. How can we help you? Let us start by saying that there is little we cannot do. Whether your needs are large or small, we can help. We are available to do everything from total cleaning, painting, carpet cleaning, carpentry or rebuilding to both the interior and exterior of properties. 365 days per year, S&D has a 24-hour Emergency Message Center which promptly pages us should you require an immediate response. Our family-owned and operated business enjoys informing new customers about how we can be of service and are happy to deliver references from satisfied customers upon serious request. S&D employs hardworking, courteous professionals to relieve your stress of dealing with maintenance problems. All S&D technicians are professionally uniformed for safety and identification purposes. S&D concerns itself enough with your properties and our employees that we carry Commercial Liability Insurance, General Liability Insurance and Workers Compensation Insurance. To alleviate liability concerns, a Certificate of Insurance can be supplied upon request. We are members of the Villa Park Chamber of Commerce and the Addison Association of Industry and Commerce as well as other industry-related organizations such as SIMA (Snow & Ice Management Association), CAI (Community Association Institute – Illinois Chapter) and ACTHA (Association of Condominium, Townhouse and Homeowners Associations). Steve, started his career at S&D with his brother Dave in 1981. Steve oversees all of the day- to- day operations of S&D Prime Maintenance, Inc. Steve has W I T (what it takes) attitude to get the job done and that is why we are still here 30+ years later. Steve provides excellent leadership for his team and constantly asks the question "How can we do it better"
David R. Piraino - President of Swish & Rub, Scour & Scrub and Vice President of S&D Prime Maintenance, Inc.
Our Janitorial Division, Swish and Rub, handles all properties including; common area condominium cleaning, offices, churches, banks, pool houses & medical facilities. Swish is a professional janitorial company providing a clean, healthy environment for its customers. Dave is always "on the spot for cleaning". Tracey's background includes business management and strong financial/analytical skills. Her focus is customer service and process improvement. With her expanding skills & knowledge, Tracey grows long lasting relationships with our customers and employees. Sandy has a solid back ground in administration. In addition to her role as an administrator, she coordinates our carpet cleaning division, which includes scheduling, pricing & creating promotions. Sandy is extremely customer orientated and is always willing to pitch in and help. Maria's key strength is her ability to organize, she keeps our crews at the top of their game by continually asking them for their best! Maria coordinates and prioritizes all the work that flows thru S&D's doors. Joe has many years of expertise & skill in the building trades, residential as well as commercial. Joe continually develops and builds relationships with our customers. Communication is key in Joe's world - A well informed customer can make knowledgeable decisions and have the confidence to do. Andrew, besides contributing as an Operations Manager/Estimator, he also maintains the entire company vehicle fleet and our technician's communications network. Andrew is constantly working to bring S&D to the next level, making sure our customers are taken care of 24/7. Second generation and carrying on tradition. Steven maintains our material procurement - If you need it, Steven will get it! Steven oversees all the material purchases; he will find and research all the best material for your project needs. Steven also manages our custom signage & vehicle lettering division.